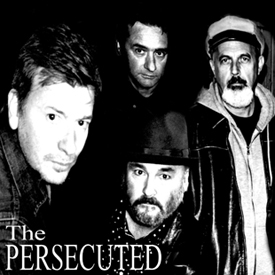 Much like you, I’d never heard of the Persecuted before receiving this, their debut album but now I’ve played it to death over a week’s constant rotation in the car, I can’t wait to see them play these songs live in either a scruffy back room of a pub or at a massive festival; I’m not fussed which. It took a while for the penny to drop; but if this had been an old fashioned LP the first side would be a collection of quintessentially English kitchen sink dramas a la Squeeze in their early days and when you turn it over the second side is the missing link between the end of the Mekons and the first Waco Brothers album (and I don’t use those band names lightly!). Album opener Slash My Wrists (W11 3DA) is an attention grabber of a tale of small town or Inner City boredom; where too much to drink is the all too easy solution to young people’s woes; and this is followed by Popping Pills a jaunty but harrowing tale; not akin to the Rolling Stones Mother’s Little Helper, about a housewife’s dependency on ‘pills’ to get her through the day. Little Britain offers a weary take on the Chav Culture (Trailer Trash?) that is taking over too many of our housing estates and the helplessness ‘nice people’ feel. My second side opens with City of Fallen Angels (CV10 9HR) which follows on from the first couple of tracks; scarily touching on the part of ‘broken Britain’ that gets forgotten about. The last few tracks are a lot more up-tempo; still ‘stories’ with an English spine but the tunes are now more Country flavoured and ‘edgy’ in a Waco Brothers way that I alluded to earlier and in singer Johnny Black they have an earthier version of ‘Jonboy’ Langford from the Wacos/Mekons. No Country album would be complete without a sad love song and that’s what this ends with; Red, White and Blues which has all the hallmarks of an end of show sing along. If only we could shave 30 years off each band member’s birth certificate and 6 inches off their waist band and they would be perfect for the New Wave of Student bands that are sweeping the Nation at the moment; but sadly the foursome are all men of a ‘certain age’ and their signature tune (and mine?) I Wish I was Still Eighteen sums up what it must be like to still be in a Rock and Roll band in your forties.